Racing is all over here in Austin, TX. I’m packed up and ready to fly home. Race results wise, not a spectacular weekend, but knowledge wise, a very successful weekend. After qualifying I was 7th in truggy and 6th in buggy. Both cars didn’t feel great and I made mistakes in every qualifier. Lap times were tight and to get a top 3, you needed no big mistakes. I was a little off fast lap speed too, so I wasn’t doing myself any favors by crashing on top of that. 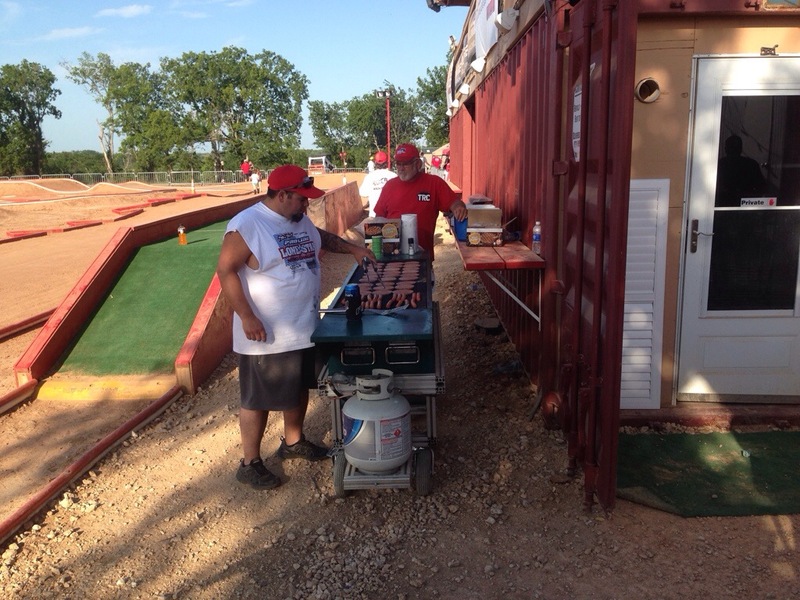 After qualifying, the track put on a BBQ and had a horseshoe tournament. Main day was next. I made a few changes to both my cars. First up was truggy main. I felt ok in warm up, but I wasn’t feeling like I had blistering speed. I went into the main with a goal of no turn marshals touching my car for the entire 45 minute main. I was gonna run AKA Impacts in Medium. I started 7th and got through the first couple turns pretty clean. After the triple Maifield came up short and that collected Cody and I got hit as I was trying to get by. I got spun out and then hit by another truck. I dropped back a couple spots, but it wasn’t too bad. I got in a good groove and ran strong, picking guys off and working back up to the top 5. Coming into the first pit stop, the top 6 were all coming in the same lap. 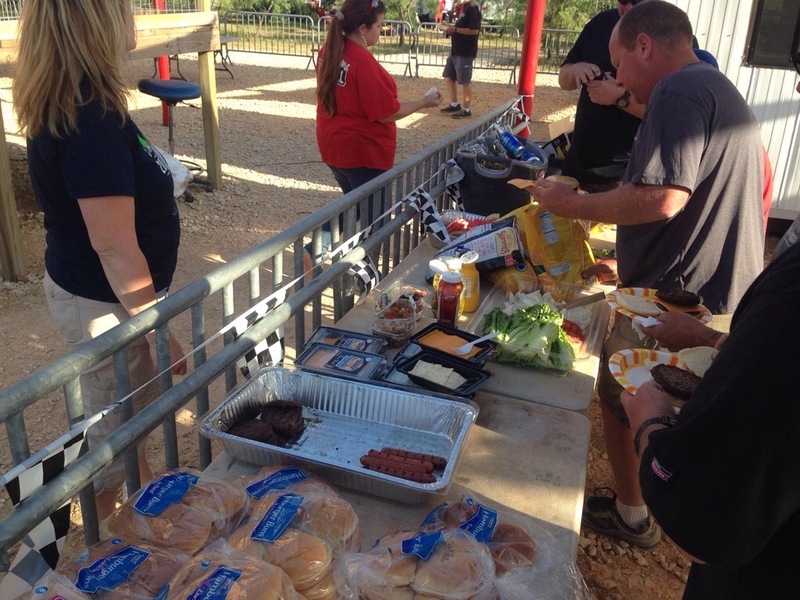 It was like a NASCAR pit and it ended up being a disaster. Joe fueled me super fast and I was full throttle coming out of the pit lane. All of a sudden Taylor Peterson’s truck was dropped right in front of me and I launched off his truck and flew off the track into the fence. There was nobody to flip me over, but the people over the fence were trying to flip it. It took forever and then they finally got me back going, but I lost close to 10 seconds. After that I was pretty bummed, but I wanted to just use this main as practice and focus on my laps and finding my groove. About halfway I started to really find my pace and get into a groove. I was in 4th and had Ty marked on the track. I was around 25 seconds back of Ty. Every few laps I was getting closer and closer. My truck felt really good, my engine was running great, and my tires had a good amount of heat in them and I was just cruising along. The gap kept getting closer, and I was running the fastest laps of the main. With about 10 minutes left I moved past Truhe as he crashed and now was in 3rd, but I was 12 seconds from Wheeler in 2nd and 17 seconds from Ty. By the end I closed up to 6 seconds from Wheeler and 9 from Ty. I felt great at the end and without the pit lane mess, I achieved my goal of no crashes for the whole main. I possibly could have challenged for the win too, so that felt great. Up next was a 30 minute buggy semi. I was in the even race and starting 3rd. My car felt ok in the practice, but it just felt hard to drive. I tried AKA City-Beams in practice, but I preferred med Impacts. Right off the start, after the first jump, Maifield crashed and I thought I was gonna be able to gain some spots. Wheeler got on the pipe in the whoops and I got clipped, but thankfully I didn’t crash, but I ended up in 4th. After the first lap I was in 5th, with all top 5 being a train around the track. We all had a pretty good battle, and I was able to work my way up to the lead before halfway. I was feeling pretty good and running faster laps than I have all weekend. I pulled out to a little lead, around 4 – 5 seconds. Came in for my last pit, got fuel, got thrown out and was full throttle to fly out of pit lane. I wasn’t quite straight, and brushed the inside wall of the pit lane….then smash…..my front wheel grabbed a crack in the wall and my front arm was ripped off my car. No final main for me. I was pretty bummed because now I was missing out on 1 hour of practice in race conditions. I ended up watching the start and the end of the main. Just to kinda watch the other guys cars and see where I would have fit in based on my speed. I think I would have been in the lead battle. I wanted to fix my car and try a couple things after the main. I didn’t watch much of the race, but I caught the last 2 minutes and that was cool to watch. Congrats to Cody for taking the win. I fixed my car and did some shock and tire testing in buggy after the main was over. I got my car feeling better and more consistent. I learned a lot this weekend and I’m excited for the Nats. My engines ran great and I had no flameouts. I will save these engines for Nats and break in some backups. I also learned I need to be more patient in pit lane. Ultimately it cost me in both classes. Truggy wasn’t fully my fault as a pit guy made a mistake and wasn’t paying attention to cars exiting. At the end of the day, I need to control me and if I am exiting a little slower and calmer, it could be better. This is the second time in my career where I was leading a race and broke exiting pit lane. Thanks to Joe and all my great sponsors for their hard work and support. Next race is in a week and half in California. Thunder Alley Duel….should be a cool event to do. Best part is the Friday before the race starts, I have a DH MTB day planned in Big Bear for me and Joe. A little thank you for all the hard work. Should be really fun. See you all soon. God Bless. My heart is very much into my RC racing career. I would not be traveling and missing my family and doing all the work behind the scenes if it wasn’t. Cycling is my hobby. I have had hobbies my entire career, I think that is very important to get out stress and enjoy something other than my job. People dont realize it, RC is not my hobby, it is my job, yes I enjoy it very much, but I can’t just go to the track and drive to have fun. Everytime I am at the track, I have to be “Jared Tebo”, I can never be a hobbiest having fun with my cars. You are very wrong I am sorry to say. Being a top professional in any sport takes a lot of sacrifice, that is why few people ever reach the top. Most people are not willing to make those sacrifices. I have been at the top level of my profession for 10 years, and I have made many sacrifices in my life. Just because I have one hobby is pretty rediculous to say that my results are suffering from it. I can say that it is very difficult to jugle a family and a racing career. Me being a good husband and a good father comes before my racing, and that might be a factor, but I am still working on getting a proper balance. People will never really understand the work, the pressure, and the stress involved in being a top professional untill they are in that situation. My RC career is far from over and my heart is still in it. Work and hobby are two seperate things. I just wanted to clear that up. Racing also has waves. Yes I haven’t won a ton of races this year, but there hasn’t been one race in any class this year where I wasn’t fighting for a chance to win. The difference from winning and finishing 2nd can be very small sometimes and it can go either way. I had a quick question. I was wondering if you prep the plastics of your cars with anything to help keep them clean during the race weekend? I’ve heard of using pledge and maxima sc1 for dirt bikes. Thanks for any help. Hey Jacub. I actually don’t use anything. I just use a brush and sometimes a little water on a rag. I don’t really like to spray things on my cars. I try to keep up on cleaning after every run and just not let them get too dirty.